from historical and gender perspectives. She argues, ‘the “Woman Question” – the question of which was a better system for women – was by no means a by-product of debates between Christians and Secularists but constitutive of and absolutely fundamental to modern definitions of religion and secularism that emerged from them’. My 2013 book, Infidel Feminism, has been largely received as an intervention into the history of feminism, pointing to a previously unexplored strand of ‘Freethinking feminism’ which existed in Britain throughout the 19th century, and arguing that anti-religious or secular ideas were fundamental to the development of first wave feminist thought. I intended the book as a response to, and partly a reaction against, the ‘religious turn’ in gender and feminist history of the last 20 years or so, which (in quite rightly pointing to the importance of religion as one of the ‘founding impulses’ of modern feminism) has now so dominated the field that many of my students today assume that religion is essentially complementary to feminism, and find it difficult to articulate why it might ever have been seen as an obstacle to women’s rights in Britain. But Infidel Feminism, was also intended as an intervention into scholarship on secularism, to say something new about the category of the secular as a whole and to take forward debates on the secularisation thesis and ‘post-secularity’. Charles Taylor’s book A Secular Age (2007) has proven pivotal in this scholarship, though much of attention it has received as been critical as well as positive. Without wanting to endorse the whole of his agenda, I was particularly interested in Taylor’s critique of narratives that portray secularisation as nothing more than a “subtraction story”, as an absence of religion. Responding to this call, I attempted to approach secularism as a substantive rather than a negative category, to analyse the positive content of that particular form of secularism that emerged in 19th century Britain (and to some extent across the Anglophone world). What values did it embody? And what kind of identities did it generate? This was obviously crucial to a historical study that focused, as mine did, on the National Secular Society and wider milieu of self-proclaimed Secularists and Freethinkers, actively engaged in constructing a secular public sphere. Secularism, for them, was not merely an absence of religion, but powerful intellectual and ethical framework structuring every aspect of their lives which compelled them to think counter to the majority of Victorian society. Where did the ideas for Infidel Feminism come from? I began my project at the University of Oxford, where I participated in the religious history seminar which was run by many of those scholars engaged in the redefinition and expansion of the category of ‘religion’ in histories of modern Britain (most notably the authors of Garnet et al.’s Redefining Christian Britain). These scholars expanded the definitional parameters of ‘religion’ to encompass personal beliefs, linguistic structures and modes of identity. They have identified religion with a variety of phenomena beyond those traditionally associated with ecclesiastical institutions and doctrinal belief-systems, leading some historians to argue that ‘transformation’ rather than ‘decline’ ought to be the key organising factor when thinking about religion in modern society. And of course this group of scholars at Oxford were building upon and responding to Callum Brown’s highly influential concept of ‘discursive Christianity’ which defined religion not as an institution, or even a set of beliefs, but as a ‘dominant discourse’ which ‘infused public culture and was adopted by individuals, whether churchgoers or not, informing their own identities’. I was also reading, when starting out my research project, a related set of debates by historians, such as Alex Owen, who were revealing the extent to which modernity, far from being wholly secularised, has in fact continued to be permeated with ‘enchantment’, with religious and magical beliefs co-existing with and sometimes complementing scientific and rational modes of thought that were previously thought to define modernity and, in the sociologist Max Weber’s terms, signify the end of enchantment. All of this scholarship was crucial in confronting the orthodox secularisation thesis, and in opening up many new and important avenues for understanding the workings of religion in 20th century Britain. But it was not terribly informative for me as someone wanting to trace not the continued influence of religion in an age of modernity, but rather the emergence of the distinctive category of the secular in this period. For better or for worse (perhaps because of the historical moment in which it emerged – the end of the 20th century with the re-emergence of religion as a powerful force on the global stage), the effect of this historical scholarship has tended to be to obscure the secular rather than to offer more meaningful understandings of it. My feeling, from attending panels on secularism at various modern British history conferences is that sometimes more zealous advocates of an expansive and discursive definition of religion, wrongly conceive of it as an all-encompassing intellectual and linguistic framework which structures the thoughts of believers and non-believers alike, causing the secular sphere to effectively disappear, an turning the ‘religious’ or the ‘sacred’ into such capacious categories that they too lose any descriptive purchase. So that was my problem, and some of my concerns – what did I try to do differently? Firstly, I tried to take seriously the reasons that individual Freethinkers and Secularists gave for renouncing Christianity and embracing a Secular view of the world. It was tempting, in light of much of the recent scholarship on the porosity of boundaries between the religious and the secular, to read Freethinkers’ accounts of their loss of faith as simply inverted evangelical conversion narratives. (Indeed this is what Edward Royle, the pre-eminent historian of the British Secularist movement, has tended to conclude when he defines Secularism as an inversion of Victorian evangelical Christianity). Certainly, Christian metaphors and narrative structures were overtly present in the writings and autobiographies of self-proclaimed 19th century Secularists, yet to simply conclude that they were deluded in their belief that they had left the much-hated religions of their youth behind, would have been to deny the reality they themselves experienced. It was hard to stop being a Christian in 19th century Britain, one risked not only alienation from one’s family and community but also – for women especially – accusations of sexual impropriety. So to treat these historical subjects simply as inverted Christians would have been to do them an injustice. Instead, I wanted to convey a sense of the fundamental transformation they felt they had undergone, as well as the antagonism they felt towards Christianity. I therefore chose the term ‘counter-conversion’ to capture this. And I focused in the book on outlining the new ethical vision that Secularists promoted – one that was committed to complete moral and bodily autonomy, freedom of speech, abhorrence of enforced ignorance and an unflinching commitment to the democratic dissemination of knowledge. A crucial aspect of (to quote Charles Taylor) these ‘new inventions, newly constructed self-understandings and related practices’ was Secularists’ response to the ‘Woman Question’ – which can be briefly summarised as a rejection of God-given gender roles, and thus the sacred bonds of marriage which entailed support for the right to divorce and various (albeit fraught) articulations of greater sexual freedom for both men and women; the inclusion of women in secular societies on a more or less equal basis, an affirmation of women’s right to speak in public and act as intellectual leaders; and a rejection of certain forms of ‘imperial feminism’ whereby, unlike large portions of the women’s movement at this time, Secularists refused to valorise the treatment of women in the Christian West as superior to that in the Muslim or Hindu world. Yet this form of Secularism was itself highly gendered, sometimes posing problems for feminism in its celebration of science and reason (masculine characterisations) versus superstition and religious enthusiasm (feminised attributes). The central argument of the book is that the ‘Woman Question’ – the question of which was a better system for women – was by no means a by-product of debates between Christians and Secularists but constitutive of and absolutely fundamental to modern definitions of religion and secularism that emerged from them. But what of the highly apparent continuation and/or vestiges of religious language, metaphors and intellectual frameworks deployed by these self-proclaimed Secularists and Freethinkers? Ultimately, although this remains a tension in the book, I was able to accept the significance of Christianity to modern Western forms of secularism, without having to collapse one category into the other, precisely because I was no longer working within the parameters of the orthodox secularisation thesis and its assumption that, in modern society, religion would necessarily give way to a secular world. Aided by some of the scholars of religion that I discussed above, who had rejected secularism as an inevitable process, and an abstract and universal concept, I was able to examine more closely a particular form of 19th century British secularism that was historically constituted and geographically specific. Of course, then, in 19th century Britain – a society dominated by Serious Christianity at the level of the state, civil society and personal identity – the form of secularism that emerged was strongly influenced by the form of religion it reacted against, in particular evangelical Protestantism. But to argue that religion and secularism in this context existed in an antagonistic and symbiotic relationship (as I did) is not to say that they are one and the same thing, nor to deny the existence and influence of ethical, intellectual and political traditions that were overtly and distinctively Secularist in their make-up. What this points to, in terms of future areas of research, is the need to distinguish between different kinds of secularism which emerged in different places at different times, and to assess them (especially in terms of their gender and race politics) according to the particularities of their content rather than some pre-determined and assumed definition of what secularism really is. 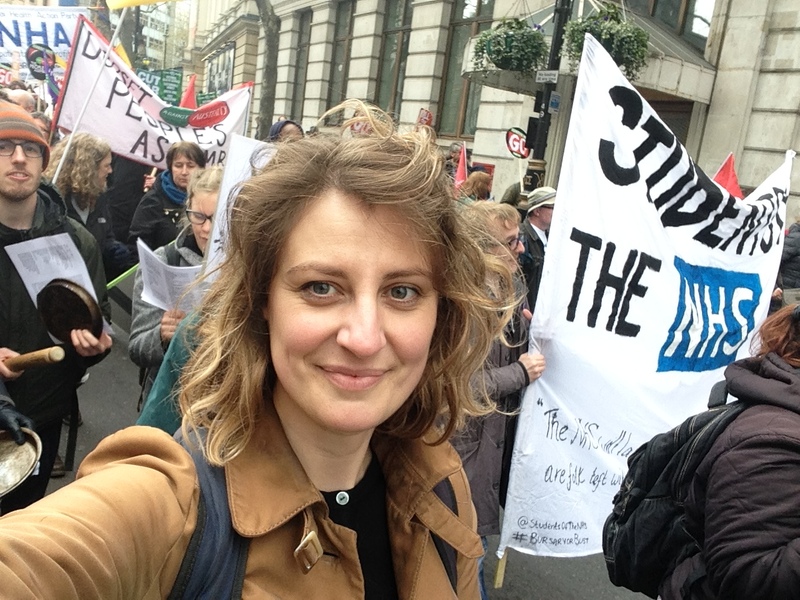 Laura Schwartz is Associate Prof of Modern British History at the University of Warwick. She has published widely on the history of British first wave feminism. Her most recent work on the history of gender, religious and anti religious thought is an article entitled ‘”Enchanted Modernity”, Anglicanism and the Occult in Early 20th-century Oxford: Annie Moberly and Eleanor Jordain’s “Adventure” Revisited’, forthcoming in Cultural and Social History.